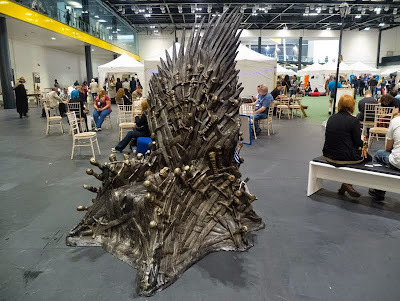 Reader, I made it to a WorldCon! 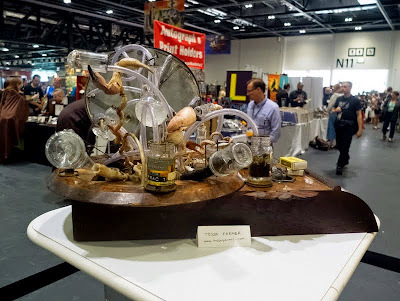 LonCon3, the 72nd World Science Fiction Convention, was happening too close to me this year for me to be able to resist temptation. 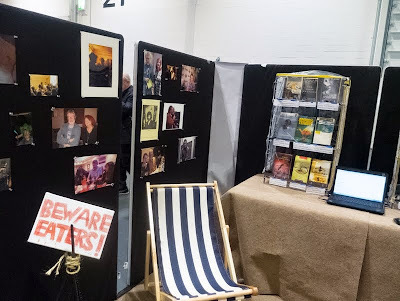 So last Saturday I got up at an ungodly hour, got on a train to London, and spent the day at the ExCel Convention Centre attending panels where writers and critics I admire discussed various aspects of speculative fiction and fandom, going to readings by some of my favourite authors, and wandering around. 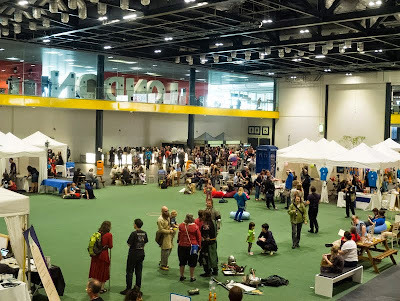 LonCon was the biggest WorldCon to date in terms of number of members, and as expected the ExCel was very busy on Saturday. 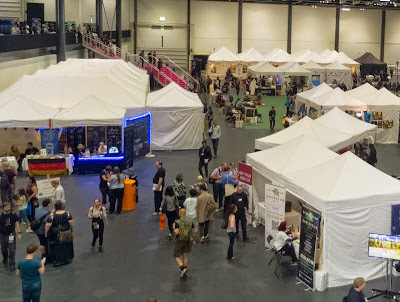 However, the size of the venue and the smooth running of the con meant it didn’t feel busy: if I was at all worried I had been too harsh on LFCC, my experience at LonCon disabused me of that notion. What a difference it makes to have access to several toilets that remain clean throughout the day; to have enough places to buy food that you don’t have to queue up for 35 minutes for a bad sandwich; to be able to move around without stepping on and/or elbowing people: in short, to be at a busy event that’s actually prepared to handle large crowds. 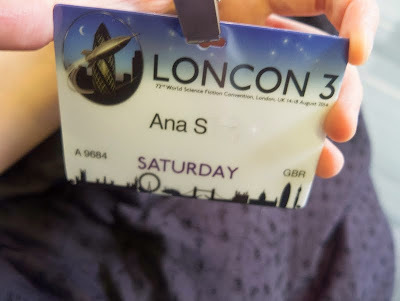 Also, even though the LonCon programme was overwhelming in the sense that there was just too much good stuff on (often at the same time), once I made my choices and printed out my personalised programme I didn’t feel overwhelmed at all. 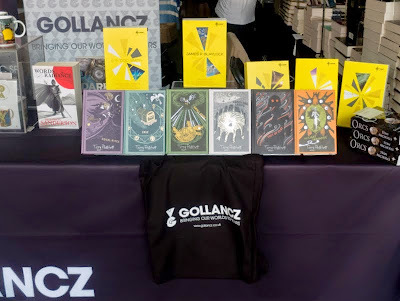 I said that YALC was a bit too much for me, but that wasn’t the case here — at least not in the same sense. There were maps and clear signage, plus lots of friendly volunteers ready to answer questions. 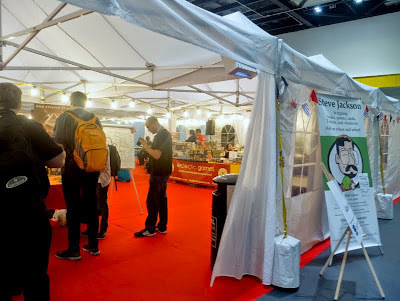 My main concern was that I’d end up getting lost on my way to something I wanted to see, but I found the space extremely easy to navigate despite its size and I could get to everything I was aiming for without any issues. 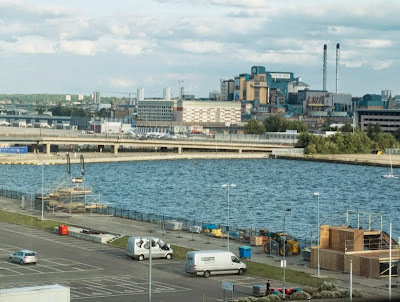 The view from Level 3. These gorgeous Discworld special editions were 3 for £25; it’s a bit of a miracle that I managed to walk away without any. 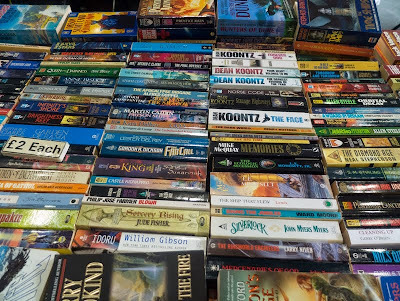 ALL OF THEM.I had a brief moment of great excitement when I thought I’d spotted a copy of The Snow Queen by Joan D. Vinge, an out of print book Memory highly recommends, but alas — it was one of the sequels. 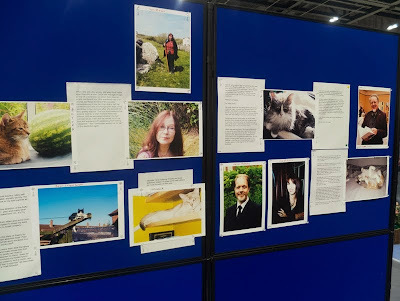 A rather lovely display on writers and their cats. ...and another on the Tiptree Award. 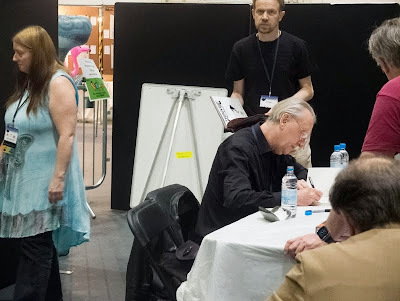 Bryan Talbot signing — sadly my copy of The Tale of One Bad Rat was many miles away. 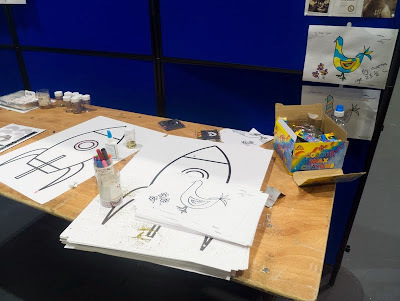 I decided early on that I wasn’t going to do any signings, to avoid carrying books all day and because I was going to be running from panel to panel as it was. But actually, both Cory Doctorow and Connie Willis were happy to sign books after their readings, so I could have had my chance easily. Alas. A tribute to Iain Banks. 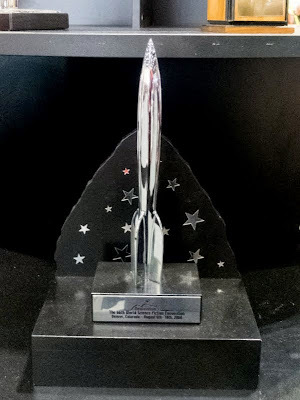 A Hugo Award! Well, a replica anyway. 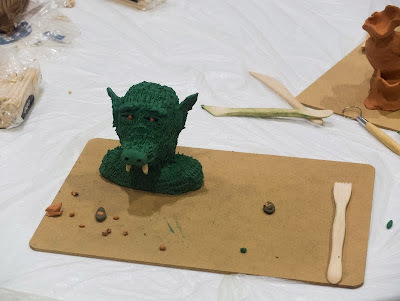 The arts and crafts zone was pretty awesome. 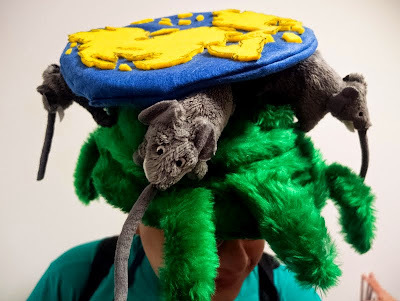 DISCWORLD HAT! This was the second coolest thing I saw all day: the coolest was the absolutely perfect Kaonashi (from Spirited Away) cosplayer who wandered into a hallway I was in in absolute silence and then wandered out again just as quietly. I was a bit too stunned to remember to take a picture, but I think that for a moment we all felt like we were in a Miyazaki film. 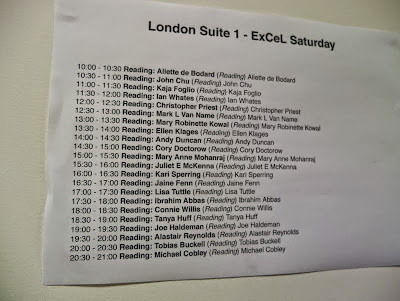 As I said earlier, I made it to a few readings: Cory Doctorow’s, Kari Sperring’ and Connie Willis’. Doctorow treated a packed room to an excerpt from an upcoming novel called Utopia, which is actually a dystopia and “a sort of prequel” to Down and Out in the Magic Kingdom. He was an engaging speaker and reader, and the bit he read was funny and warm and full of the political themes that draw me to his work. I can’t wait for the book to come out. 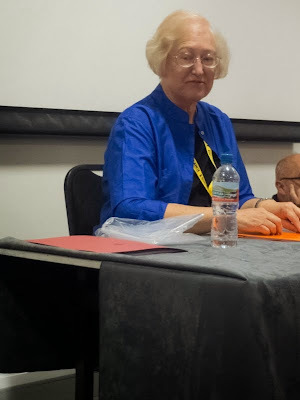 Kari Sperring (who I admire so much and really wish I had been brave enough to say hi to) also read from a work in progress: I missed the introduction, as I had to run down from a panel on level 3, but by the sound of it it’s a work set in the same world as The Grass King’s Concubine. The piece she read us was wonderfully written and deeply concerned with women and power, which is more than enough reason to get this book as soon as it comes out. It was also amazing and raw and the kind of thing you almost flinch to see read aloud in public, because it’s still so rarely voiced — only of course we should speak of it in public, because the whole problem is that we don’t. Connie Willis’ reading ended up becoming an impromptu mini-talk, as she thought it would be more fun to tell is a bit about what she’s writing at the moment and answer audience questions (and it was indeed a lot of fun, so no complaints). Willis said she’s working on a novel (currently called The Very Thought of You but likely to change) whose premise is the following: there’s a new procedure you and your significant other can have, a sort of “outpatient brain surgery”, that makes you perfectly attuned to each other’s emotions. You become not exactly telepathic, but empathic: you can pick up each other’s moods and etc with perfect accuracy, and it’s supposed to solve communication problems once and for all. The surgery only works is people are really emotionally invested in each other, though, so couples have begun to use it as a kind of “technological equivalent to a pre-nuptial”. Of course, in reality this is a terrible idea (Willis said she believes that having the right to private thoughts and feelings is crucial, even within the context of intimate relationships, which YES) — the first thing that goes wrong is that the protagonist, who is talked into the surgery by her partner, becomes fully telepathic rather than just empathic, and it all goes downhill from there. Willis said the novel is actually a romantic comedy (which she called her favourite genre), and I absolutely can’t wait to see what she does with this premise. So yay: three readings/author events, three books I’m ridiculously excited to get my hands on. Last but not least, there were the panels I attended. 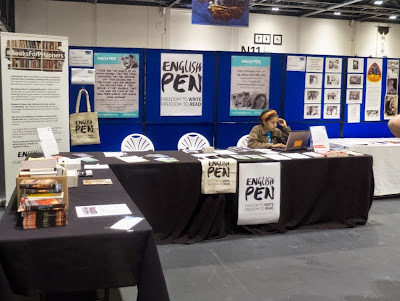 I took a lot of notes, though as always they are very much partial and filtered through my brain, which means I unintentionally zoom in on my specific areas of interest and on some panellists more than others. Hopefully I’ll still be able to give you an idea of what they were like. 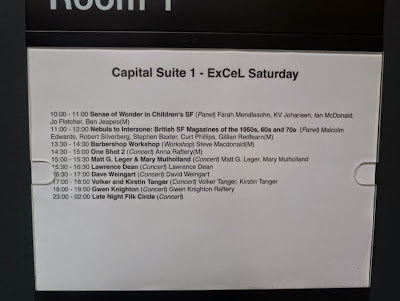 Sense of Wonder in Children’s SF with Farah Mendlesohn, KV Johansen, Ian McDonald, Jo Fletcher and Ben Jeapes: My first panel of the day asked the question, “what is this ‘sense of wonder’ within literature and how does it continue to ‘blow the minds’ of young readers? What are the most spectacular feats of worldbuilding in the YA canon?” Ian McDonald started the conversation by saying that to him, a sense of wonder is linked with encountering a world that “feels both familiar and completely far removed”: you half believe in it, but you know it can’t be reached. To KV Johansen, wonder comes not so much from familiarity but from otherness. And for a child reader, there will be many things that will be “other” simply because their experience of the world is more limited and they could be encountering whatever is included in a story for the first time. It could happen with historical fiction, for example, because the past is different and new. Fantasy elements can of course bring about this sense of wonder, but it can also happen with quite ordinary things. Jo Fletcher associates wonder with yearning, but unlike McDonald she believes this yearning is for something that seems to be just around the corner, rather than for something completely far removed. It doesn’t feel unattainable, and that’s what fuels the wonder. Lastly, Farah Mendlesohn said that a sense of wonder and a half-belief in fantastical worlds was never what got her into SFF. Part of it, she said, probably has to do with being more the “geeky science fiction type” who wanted to take engineering classes and figure out how everything works. She also talked about how she spent her childhood reading books full of children doing things she wasn’t physically capable of doing due to illness, and that was more of a factor than wonder in what drew her to stories. Jo Fletcher brought up the fact that children have a far less firm awareness of genre than adult readers do. They haven’t necessarily decided that they don’t like certain things, and that makes them more willing to embrace different types of stories. Genre categories help people decide where to shelve books, but young readers don’t necessary draw a distinction (which brings us back to what Johansen said previously about wonder not being exclusive to SFF). 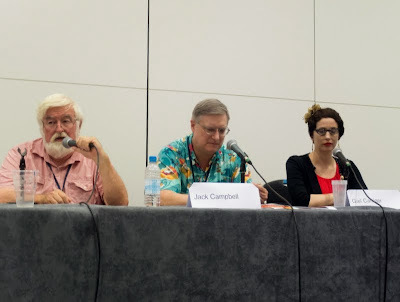 Moving on to the “spectacular feats of worldbuilding” bit of the panel (aka the “I need to read ALL the things” bit), KV Johansen brought up Patricia McKillip’s Riddle-Master Trilogy. She also mentioned Philip Reeve’s Larklight, which she said is “full of wonder and comedy” and which her 8-year-old nephew loves. Both Fletcher and Mendlesohn brought up Diana Wynne Jones — especially, Mendlesohn said, the second Dalemark book, which “tears apart every trope about revolutions in a society”. It’s also set in an industrial fantasy world, and was written a good twenty years before we started seeing more of those. Here Johansen intervened to say that Lloyd Alexander’s Westmark books do something similar (I have no idea why I haven’t read those yet). Returning to Diana Wynne Jones, Farah Mendlesohn said it’s no coincidence that she was part of the first generation of writers directly influenced by Tolkien: she figured out how he did what he did, and then she did it better. 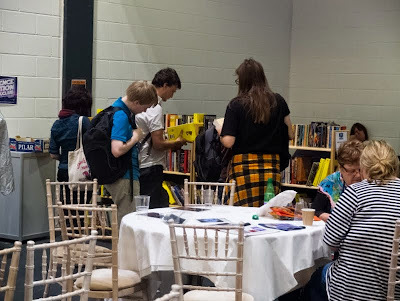 Then just as time was running out, Mendlesohn asked her fellow panellists to conclude with the names of their favourite YA worldbuilders: they mentioned Philip Pullman, Diana Wynne Jones and Frances Hardinge. I can’t think of a better list to finish with. The Review is Political with Kevin McVeigh, Abigail Nussbaum, Tansy Rayner Roberts, Elías Combarro and Alisa Krasnostein: This panel began with the establishing of a few premises that all panellists agreed on: no reviewing choices are neutral, though some are the default, and choosing to review (or not review) something is a political act. Nussbaum said that as an editor, she keeps an eye on the number of women Strange Horizons reviews, on the number of women reviewers they work with, and also on who to assign a specific review to. She knows that each of her reviewers will have a different focus that will make them highlight different aspects of a book, and that in itself is a political decision. 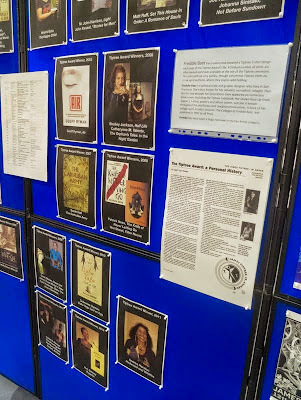 Tansy Rayner Roberts mentioned the very successful Australian Women Writers Challenge, and how participants increasingly realised that even simply keeping an eye on your reading stats can make you aware of their political implications. This has been my experience too: ever since I switched to an Excel spreadsheet that makes me aware of the diversity of my reading as I enter data throughout the year (rather than just calculating my stats come December), the fact that my reading is still less racially diverse than I’d like has been on my mind more, and that has driven me to action far more than only thinking about it at the end of the year would. Alisa Krasnostein said that creating Galactic Suburbia, a podcast where three women discuss SFF from a feminist perspective, was a political act: they were creating a space where they got to be heard. This made me happy because it’s not at all different from the logic behind the creation of Lady Business. Kevin McVeigh reminded us that a lot of the time these conversations are still hindered by the belief that men are “just not interested” in reading books by women, and that this disinterest is seen as politically neutral (which YES: see everything I was saying about Joanna Russ last week). Tansy Rayner Roberts added that part of it is down to the fact that people still believe the world is a meritocracy: that the “best” books are the ones rising to the top and getting the most coverage, and therefore making an effort to promote more obscure diverse authors will mean compromising quality. 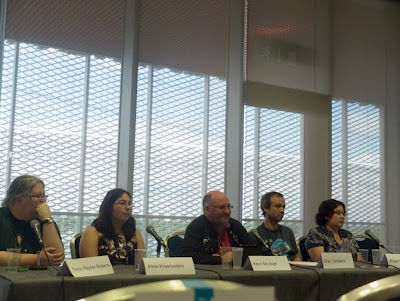 The panellists agreed that the political choices you make as a reviewer go beyond gender, of course: they also involve race, sexuality, disability, country of publication, etc. Elías Combarro said he makes an effort to review more obscure books because what could you possibly have to say about a work like Game of Thrones that is new? Abigail Nussbaum offered a counterpoint to this: although there is value in seeking out works that are getting less coverage, it’s also interesting to see different perspectives on popular things, because different reviewers never highlight the exact same aspects. Alisa Krasnostein and Tansy Rayner Roberts agreed that your political perspective is not really something you can switch off, and this is not at all a negative thing. You don’t get to take a break from being a woman, or a POC, or lgbtq; you can’t unsee things or step away from a perspective that’s informed by how you experience the world. But bringing your experience into your criticism makes it more exciting: who would want to read a review written by a robot anyway? To Tansy Rayner Roberts, deciding which reviewers you read also has political implications. Who do you listen to? Who do you take seriously and why? What is it about their perspective you value? Rayner Roberts and Nussbaum also highlighted the value of engaging with flawed media that nevertheless drives you to talk about. Nussbaum said she spent a lot of time a few years ago writing about Battlestar Galactica and Dollhouse, two series that were full of problems but also of meaty stuff that she wanted to discuss (having recently finished Dollhouse myself, all I can say is YES. It infuriated me and there were things I was incredibly interested in and I’m dying to write about it). There was a question from the audience about what each of the panellists’ political focus was and whether it was always the same: Nussbaum said this is something she’s been thinking about more and more and that has become a concern of hers. She said she’s a woman and hers is a primarily feminist focus, but there’s a danger that she’ll end up writing reviews that are a checklist of representational problems and issues she cares about. At the same time, though, these issues are important and merit discussion. She’s been trying to strike a balance between her own personal filters and reading the book as it was written. McVeigh added that no review can include all possible focuses (or even all the ones you care about, I’d say), so the important thing is to be aware of which one you’re picking and how you’re framing your review. Feminism and Sexism in Fandom with Megan Waples, Katherine Jay, Kristina Knaving, Kate Keen and Kate Nepveu: Before I write about this panel I need to make a disclaimer. 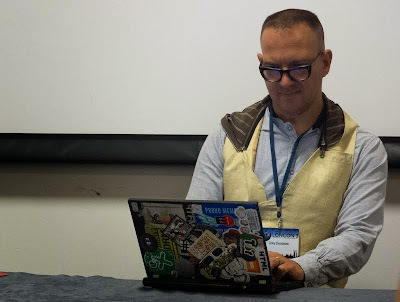 I arrived a few minutes late because it was back to back with Cory Doctorow’s reading, and because I grabbed one of the few remaining seats at the back I couldn’t read the panellists’ name tags. This means I can’t attribute comments to the people who made them, which makes me feel terrible. But rather than not report at all on what was a very interesting panel, I thought I’d go for a bullet points approach and just highlight some of what was covered. When I arrived someone was saying that the focus of the panel was sexism and feminism in fan spaces, rather than in the media we consume. 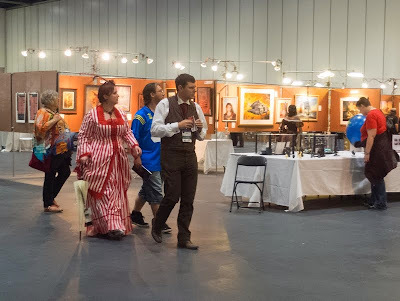 A different panellist then shared an experience a friend had had at LonCon a few hours before: a man had randomly approached her and said, “That’s a nice dress. 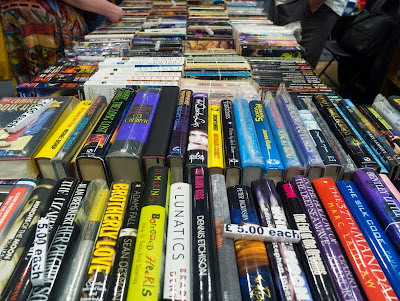 Shame it doesn’t come in your size.” This got me thinking of something milder that had nevertheless upset me earlier: the fact that I was asked no less than three times if I liked SFF while browsing books in the dealer’s room. One of the times the bookseller in question actually said, “Oooh, here’s a pretty girl! Do you like science fiction?”, which feels creepy no matter how it’s meant. But even if you leave that out, there’s the fact that “Do you like SFF?” is actually a very loaded thing to ask a woman at a SFF convention. Knowing it’s probably meant to be the beginning of a sales pitch, a way in to lead to purchase suggestions, doesn’t erase the fact that we live in a world where women are constantly exposed to different incarnations of the “Fake Geek Girl” meme. What the panellists were getting at, and what my experience drove home, is that fan spaces are still not always comfortable for female fans, no matter how many strides we’ve made. And as someone pointed out, while it’s important not to be pushed out of spaces you want to be in, women also have the right to choose to spend their time in spaces that already feel safe. 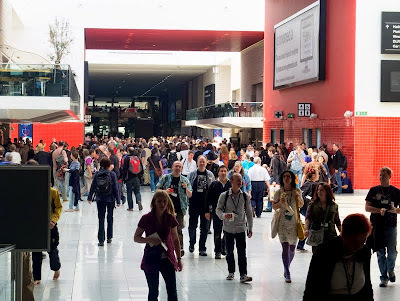 The movie crowd scene stats Geena Davis has uncovered were also brought up: on average, crowd scenes in movies only show about 17% women, which probably contributes to the belief that spaces that approach equality are actually “female dominated”. It can be frustrating, someone said, to feel that conversations about gender in SFF fandom are constantly starting from scratch, but it’s important but remember people are at different points in the conversation and this doesn’t mean there’s been no progress. It can be tiresome to feel you’re constantly going back to 101, but when that happens you have to know it’s okay to take a break and walk away. You’re not alone and you can pass the torch; someone else can move the conversation forward on that particular occasion (again: yes). 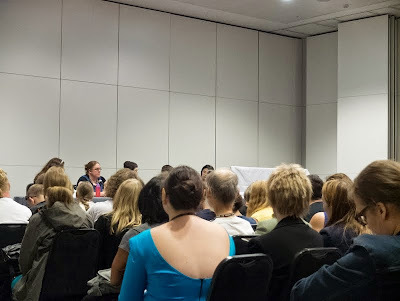 One of the panellists mentioned the constant belittling of fanwork, which is mainly created by women: according to a recent A03 census, only 4% of respondents were male. The self-selected sample that answered the census does not equal the totality of male fanfiction writers, of course, but the fact remains that these are primarily female spaces, and this fact and the derision often directed at them are not unconnected. 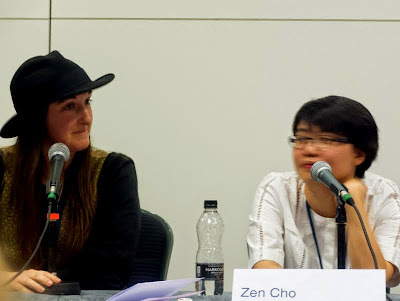 Another panellist then discussed the culture clash she experienced when she moved from media fandom to mainstream SFF, where it’s male voices that are valued above all others. None of this is to say, of course, than fanwork spaces are perfect: she also said that “Mary Sue” accusations are still thrown at fanfiction focused on female characters, when equivalent stories focused on men are widely beloved. She also noticed that although female-focused stories tend to get great feedback from vocal fans, they get fewer views and are shared less widely than stories about male characters. In conclusion, it’s practically impossible not to internalise some degree of misogyny when you grow up in this world, and even predominantly female spaces do have their issues. One panellist offered a theory: she suspects that the pushback against feminism is becoming more visible because we’re on the cusp of a chance. She said she wants to believe this, and I do, too. Everyone agreed that at the very least now we openly discuss things that used to be silenced, and bit by bit the status quo is becoming less consensual. There’s hope to be found in that. One last thing: this panel was completely packed, which was great to see. I had to miss the Q&A bit, so here’s hoping that no one in the room was there to argue that sexism is over. The Education and Training of a Young Protagonist with Zen Cho, Gail Carriger, Jack Campbell, Frances Hardinge and Dave Luckett: My final panel began with a brief discussion of what education is in the context of SFF: for Gail Carriger, education is to a great extent indoctrination into the wider culture. You learn to socialise and become part of the herd. In her Finishing School series, she wrote about girls who are trained to subvert the dominant culture under the guise of being taught how to fit into it. She likes to play with the very notion of education, and that was part of what motivated her series. 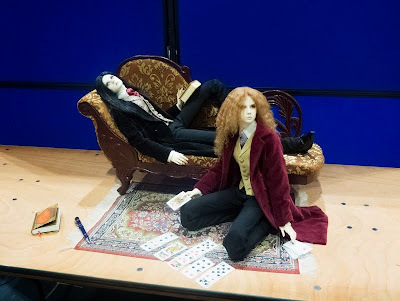 Frances Hardinge said that the way education is portrayed in fiction is more benign in some stories than others. It’s benign in the ones where the emphasis is on teaching the young protagonist how to think, and less so when it’s on teaching them what to think. There’s often an unpicking point in YA narratives where the protagonist realises that there are gaps in what they’re being taught. She also said she’s extremely interested in deprivation from education as a form of disempowerment, and in writing narratives (like Fly By Night) where seeking out education therefore becomes a form of subversion. Frances Hardinge then brought up the completion of one’s education, whether by orthodox means or not. She said the Harry Potter books transition from MG to YA as Harry and his friends learn more and more about the world, and that to her it made perfect sense that they don’t go back to Hogwarts in the final book. By then they know more than what a formal school setting can accommodate. This is visible in Garth Nix’s Sabriel too: the protagonist leaves school in chapter two, and when she comes back at the end there’s a deep contrast between what she learned fighting the darkness and the “frail and ordinary reality” or what at first seemed like an exciting magical school. To Hardinge, part of the appeal of boarding school stories is that they’re safe, but not too safe. They’re fantasies of freedom from parental supervision, because even when the school functions as a parental replacement of sorts it doesn’t command the loyalty that usually comes with family ties. You can choose your own friends and enemies, and eventually breaking the rules becomes an inevitability. Gail Carriger then said something that I just loved, and that made me want to get her Finishing School series immediately: she said she likes school settings because she likes to write “vastly networked protagonists”. She very much doesn’t want to write Hero’s Journey type narratives, where it’s a single person against the world, and school settings give her protagonists the chance to make lots of friends who then become allies and sources of support. She’s very much invested in writing stories that portray this as a good thing. ***Wow, that is a lot of works. My sincere thanks to anyone who read this far, and I hope you enjoyed the recap and virtual tour. The vast majority of writers at a SFF con will be absolutely thrilled for somebody to go to them and squee. Really absolutely. Remember, outside of a con they are not famous people. This is their chance to enjoy their readers. They will likely buy you a beer! Iain Banks did to me. And during this con I drunkenly hugged one Really Big Name Author, who was really gracious about it. As for the sexism, British fandom is trying very hard to push back against it. 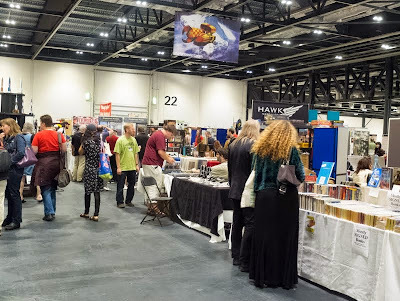 I think Loncon had panel parity, for example. We also had a code of conduct and what we thought was a clear way of reporting problematic begaviour, but I think we might need to be more proactive about that. Still, people have actually even removed for code of conduct violations. Hopefully the message that some behaviours are not acceptable will become more and more pervasive. I'll try my very best to keep that in mind in the future! It's more the fact that I'm very shy offline than anything else, but encouraging comments like yours will hopefully make it a little easier next time. I noticed the panel parity, and I appreciated that (as well as the programming, which had so much feminist, queer friendly and anti-racist content) so much. I.m grateful for everything that has been done to address sexism in SFF fandom, and I know that the fact that not everyone got the message yet doesn't mean we're not getting there. I'm green at the thought of you getting to meet Gail Carriger. I'd be too nervous to do more than wave, but I absolutely love her books. I have to admit to always feeling a bit left of center when attending fandom events... there IS that feeling that I'm not quite what's expected and it's hard to overcome when faced with comments like the one you received. Even at work I often get looks of bewilderment when people realize I read comics and genre. I love this entire post! 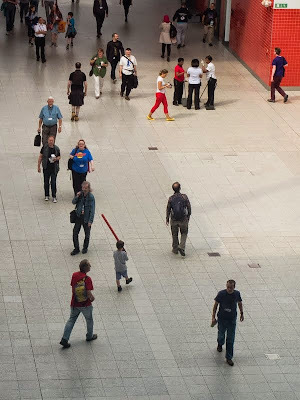 Great pictures (I squeed over the tiny lightsaber-wielder even before I got to the caption), great recaps. I'm thrilled the panelists who discussed Children's SF both mentioned DROWNED AMMET and compared it to WESTMARK. It's always so nice when authority figures mention things you yourself have noticed. I'm considerably less thrilled with how those dealers spoke to you. 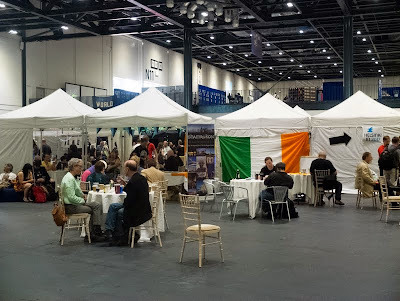 :( What did they think you were doing at an SFF con if you didn't like the stuff? Argh. May I link to your photos or download and upload with attribution for my facebook to show work colleagues what it's like. ..will link to blog too but some just want photos and I hardly took any!! Carriger's comment makes me want to get her Finishing School books too! I've never been sure if her books are for me, but it sounds like her YA might be. It's also really interesting to hear Nussbaum's point about her reviews becoming just checklists of representation issues - something I can never image from her writing, but worry about with mine. It's easy to end up concentrating on the same pervasive sexist issues, and boring people with that repetition (right now I'm stuck on casual "realistic" sexist comments which aren't part of a theme/argument/teaching line - DON'T DO IT AUTHORS). Sometimes I get the feeling that people like one review structured around this kind of topic - like an issues essay with book content - but if you keep coming back to it then it wears thin, but... it's so often there punching you in the face. Oh how fun this sounds. I wonder if one year I could make it to this -- that would be a BRILLIANT vacation to be able to take. A number of my friends are making plans to go to DragonCon this upcoming weekend, and I can't make it, but I reeeeeeally want to go to a con sometime. It sounds so fun. All the panels and things. How exciting! I met Farah Mendlesohn at WisCon last year and enjoyed hearing what she had to say on several panels. Afterthought: When taking notes, you could have provisionally designated the panelists 1 to 4, and read the name tags afterwards :-) But thanks for the recaps anyway. You know, it's possible that I bought that Snow Queen sequel - I definitely found the one that I've been missing at the dealers' room! Thanks for writing up the Review is Political panel - I'm terrible at taking notes in my own panels and couldn't remember what everyone said. I like taking notes during panels too, and really I'm amazed that more people don't! So very glad you enjoyed yourself, and thanks for all the great reporting of same! And now for a plug for my favorite institution: As for Snow Queen, have you tried your library? And interlibrary loan is an option if it's not at your nearest branch. Failing that, ABE Books or other booksellers often have out of print books available, if you're not picky about condition. Am reeling from the “Oooh, here’s a pretty girl! 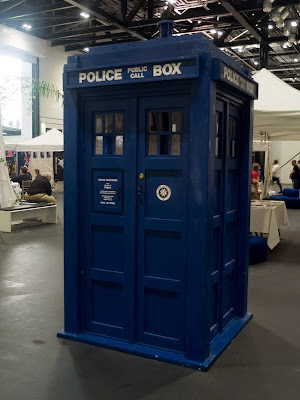 Do you like science fiction?” comment - especially in the context of a Con. What a bloody idiot... I have only recently "outed" myself as a bit of a geek at work and am really startled how many people are confused that I am a female of (hem hem) years who reads and watches SFF stuff, collects original Star Wars figures and plays console games. I honestly didn't expect such a blanket reaction from colleagues but hey ho... There's a long way to go! So glad that you had such a good time and I'll be less of a wimp the next time I want to go to something but feel like a fraidy cat! I debated between a Saturday and Sunday day admission - ended up going for Sunday, so I love your recaps, thanks for posting! And you have pictures too - I kind of gave up on posting pics after I had a look at my first two very blurry ones. 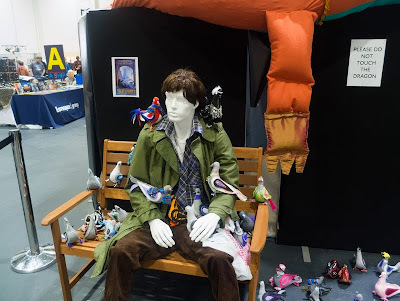 But all in all, I did enjoy LonCon3. 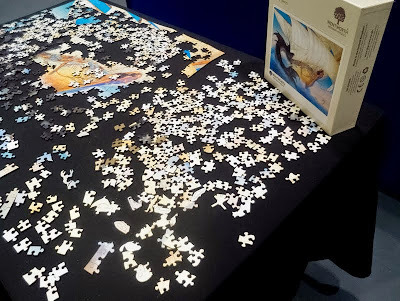 I am so glad my reading worked for you: I was really nervous about selecting that piece, due to the content, so I am delighted that you found it effective. Thank you so much: you've made my week. Oh wow, this good stuff! What great panels you got to attend! 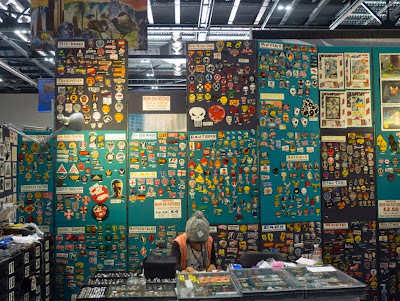 That vendor guy was creepy and a good example for your point which makes me sad that there is even a point that had to be made. It does feel like change is starting to happen though. I mean, sexism is talked about more openly and even men in the SFF community are speaking out on it. From the angle of your photo it looks like we must have been sitting practically next to each other at the Connie Willis "reading"!